Jet aircraft landed at the airport for the first time in 1961, and flights from Europe commenced the following year. The terminal received five expansions; however, the city government eventually did not have the funds to cope with rising traffic. It proceeded to sell the site to the federal government in 1966 for $2 million. 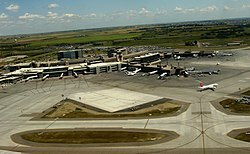 The new owner refurbished the runways and renamed the site "Calgary International Airport". Eleven years later, it constructed a new terminal worth $130 million–the core of the present facility. 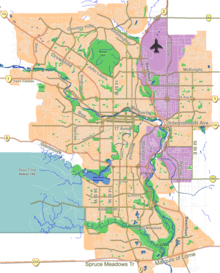 The Calgary airport houses two terminals, one for domestic operations and the other for international flights. The domestic terminal itself contains three concourses labelled A, B and C; the international terminal is composed of Concourse E for United States–bound flights and Concourse D for flights to other countries. Passengers travelling to the United States clear customs and immigration prior to departure at the preclearance facility. 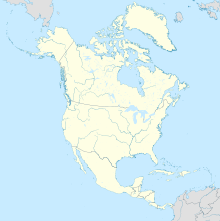 ^ a b "WestJet outlines 787-9 long-haul and new Calgary – Europe service in S19". RoutesOnline. 10 October 2018. Retrieved 10 October 2018.